“Dave Charron adds business ideas and value far beyond what attorneys are expected to do. I feel that I have made at least as much real estate income off of the bright “value-add” ideas generated by Dave as I have paid in the last 25 years of very fair legal fees. What could be better than that?” – Jon Rooks, 2012 Real Estate Excellence UM/ULI Award Recipient, Parkland Properties. Union Square is a luxury condominium development on the west side of Grand Rapids that consists of high ceilings, wood floors, huge windows, a rooftop pool, hot-tub, club house, exercise facility and a rain garden. It’s urban living with a new outlook. Since its development, several new bars, restaurants and other commercial entities have been constructed or relocated to this part of Grand Rapids. We have an experienced staff that can assist in a wide variety of legal matters. Whether it’s preparing corporate forms or complicated litigation, we provide calculated support that is tailored toward your needs. We primarily handle non-criminal matters with an emphasis on business, condominium, construction, real estate, and estate administration. To see a more detailed list of our practice areas, please click here. “Since I started my real estate development company 25 years ago, I have worked with dozens of attorneys on both sides of the table. In large real estate transactions, many attorneys try to justify their fees by making unnecessary and sometimes overly aggressive changes. Often this exasperates the process, makes the experience frustrating and can even kill deals. Dave Charron and his law firm have never done this. They try to create win-win solutions for their clients and make good deals happen.” – Jon Rooks, 2012 Real Estate Excellence UM/ULI Award Recipient, Parkland Properties. 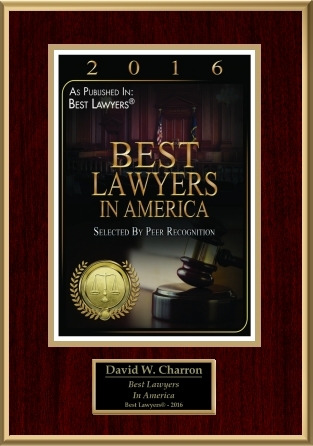 Attorney Dave Charron was recently recognized by his peers as one of the “Best Lawyers in America”!